to view and purchase Original oil paintings. Hollyhocks are very tall plants of varying colors. These are soft pale pink. 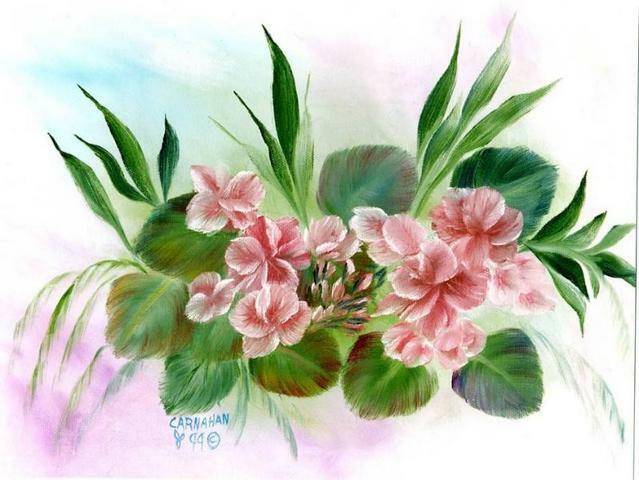 The style of painting here makes them look soft and delicate. Iris are delightful flowers and a lot of fun to paint. With so many variations of color, and shape, the possible paintings are unlimited. When I have their names, I title the painting with that name. 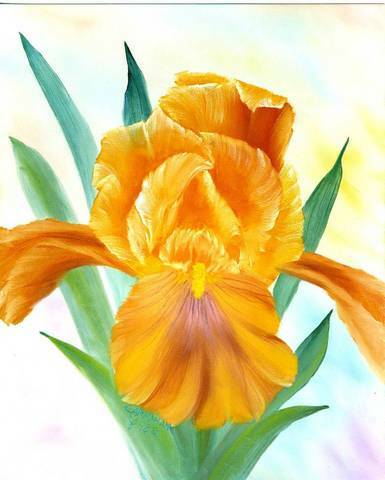 This bright colored Iris painting would look great in many locations in your home. I got the idea for this painting at a rest stop along a highway. The bed of cosmos was beautiful. I felt the painting would be more interesting with the added butterflies. 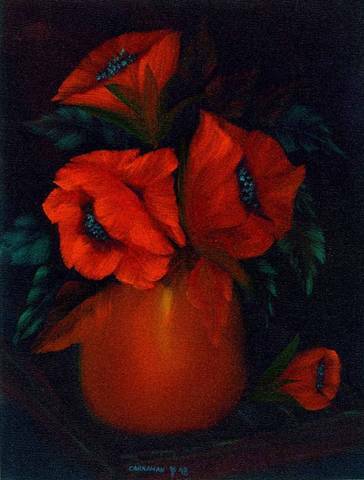 These fantasy poppies are painted on a black canvas and that makes them more brilliant and beautiful. 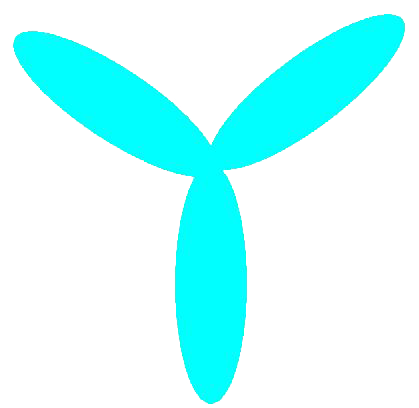 This is a technique I teach and is very easy to do. Flowers of wildlife? Or both. It makes an interesting painting either way. 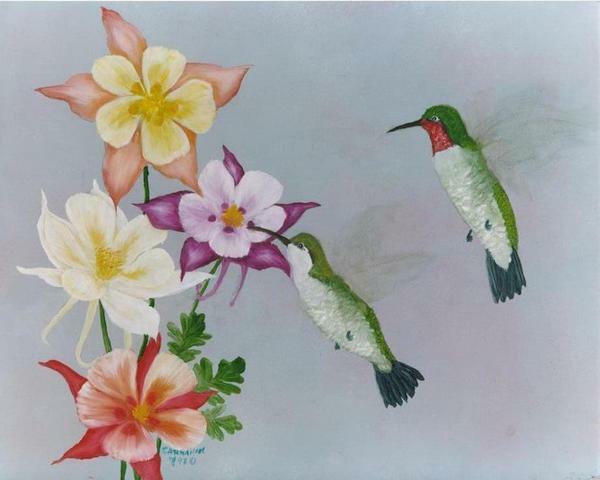 I have always liked columbine and Humming birds. Until recently I have had a hard time getting columbine to grow, now they grow like weeds. Roses, violets and daisies make a fun bouquet. many of the ideas for flowers come from the flowers in our own yard and garden. Martha Washington is an old favorite in geraniums. I can remember them as a kid. It is still a very beautiful flower. 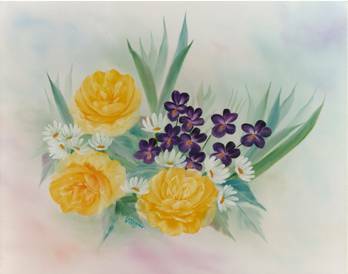 I like to paint flowers as they are all interesting in their own way.